Peanut Butter Chocolate Toffee Crack Bark has a graham cracker base, an easy toffee on top, plus chocolate chips and peanut butter. 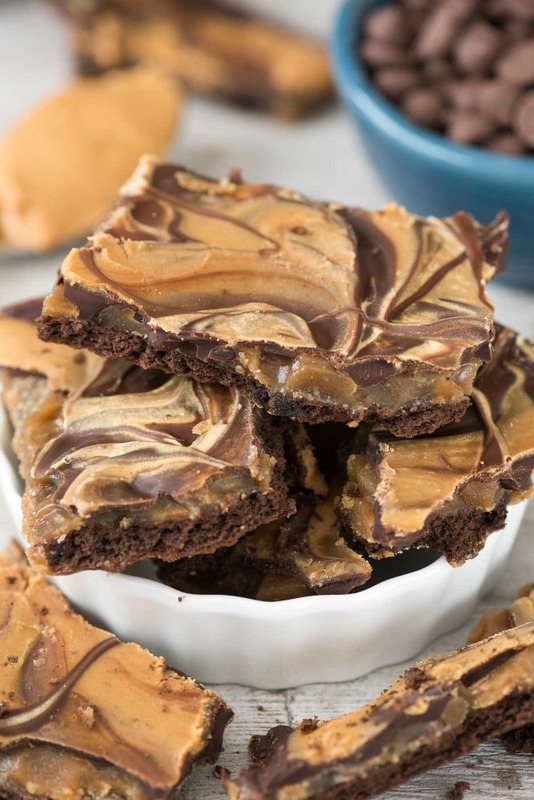 A great holiday dessert recipe, or to curb a craving for toffee, peanut butter and chocolate! Well, we’re well into the holiday season now. Before you know it Christmas will be here! I’ve already started baking cookies and freezing them to give on my holiday platters. Every year it seems I add more people to my giving list: teachers, neighbors, friends. It’s a good thing I have cookies in my freezer all year long or I’d be going crazy thinking of things to make for everyone. Every year I think about all the new flavors of things I want to create; new cookies, new candy, new bars to try. There are very few repeat desserts made in my house, in fact only two are guaranteed to be made year after year: sugar cookies and toffee. Sugar cookies because I love them and toffee because Mel eats it and I’m evil. This year I plan to have an array of goodies, including this Peanut Butter Chocolate Toffee Crack Bark. Wow, that’s a mouthful name, right? I couldn’t decide what to call this. It’s toffee but it’s bark, and it has graham crackers and chocolate and peanut butter. Basically, it’s the best thing in the entire world. 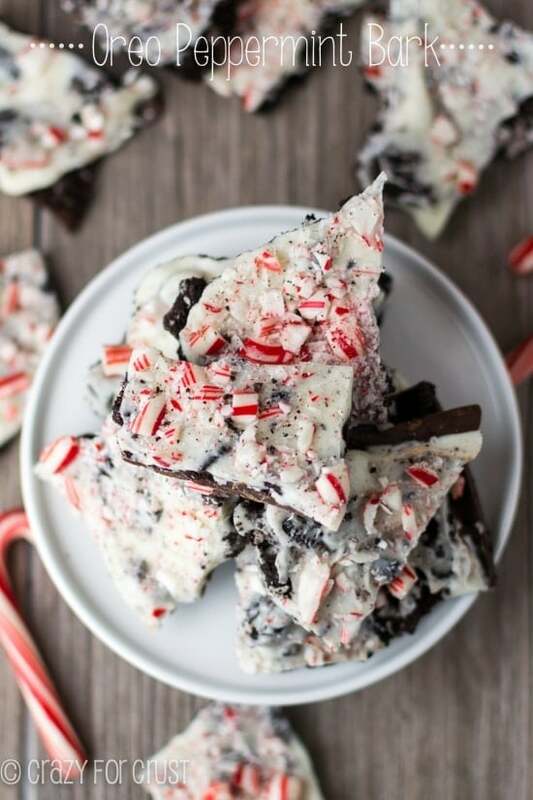 You’ve probably heard of Christmas Crack before and this easy candy bark recipe is another version of that. It’s called crack not because it’s addicting, but because you “crack” it to break it up. The toffee “cracks” as you pull it apart. Normally toffee bark like this is made with saltine crackers or Matzo crackers, or you may have seen it made with graham crackers. This one can be made with any of them, but what makes it different than all the rest is that I made it with CHOCOLATE graham crackers. And peanut butter! Have you ever had chocolate graham crackers? They sell them with the other grahams in the cookie aisle at grocery stores and Walmart. 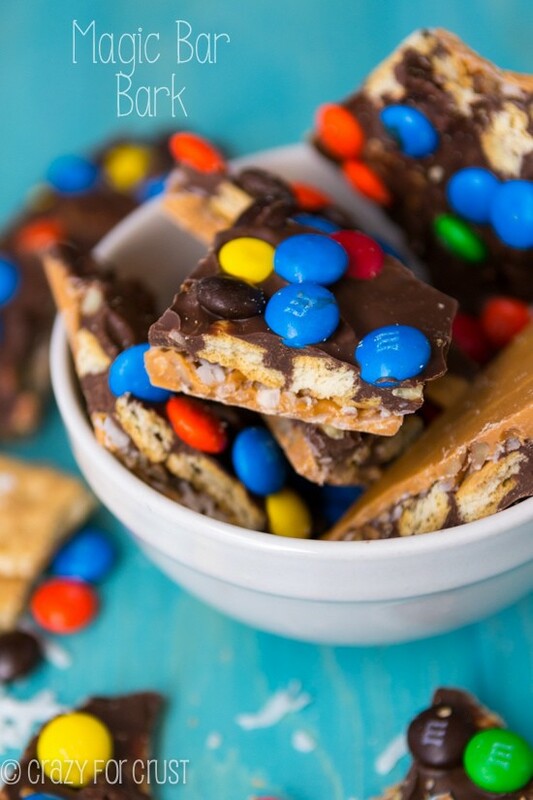 They aren’t too sweet and are the perfect base for the Peanut Butter Chocolate Toffee Crack Bark. The toffee is actually easy to make, even if you’ve never made it from scratch before. You just need a candy thermometer or an instant read thermometer to check the temperature of the sugar mixture while it’s cooking. It only takes a few minutes and then you bake it. Once you add the chocolate and peanut butter it sets into a delicious toffee that cracks when you break it. Of course, if it was up to me I’d just pick up the whole thing and eat it. 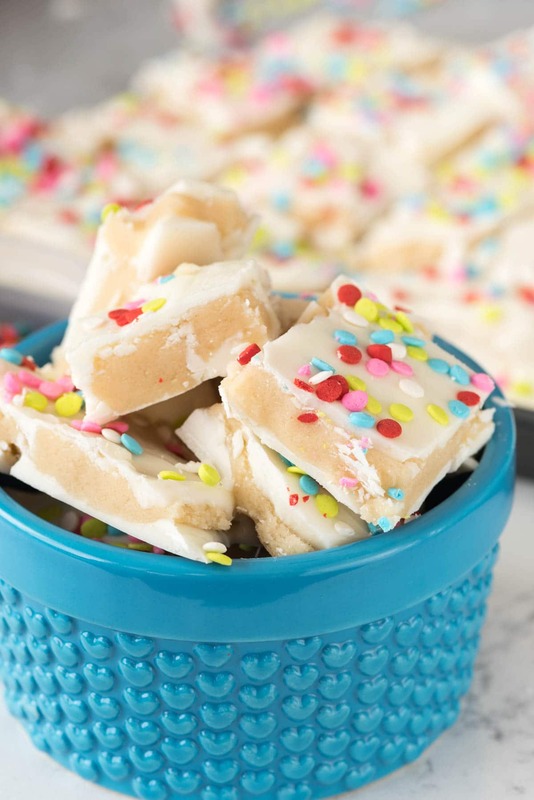 Toffee bark like this is perfect for gift giving. I’ve given up on buying those Christmas tins and paper plates for gift giving. They just take up space in the garage and they don’t keep anything fresh. My favorite thing to keep on hand all year long for sharing all my goodies are Glad® containers; I always have tons of them in my plastic drawer and I’m regularly handing them out to friends full of pies and cookies. 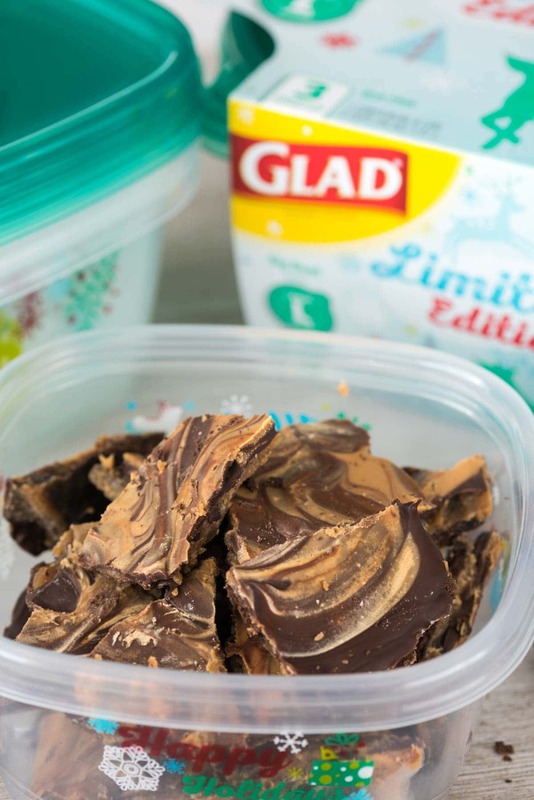 Now, even better, Glad has holiday containers you can use for giving – they have these happy holiday decorations on them and come in three large sizes, perfect for edible gifts. I also have them on hand at parties to send home leftovers – they keep things fresh, can be frozen, and they can be washed and reused. Stick a bow on top and you have an edible gift already wrapped. The Glad holiday containers are only sold at Walmart and on Walmart.com, so be sure to check them out. And if you want to grab some, before you shop check out Walmart grocery pickup, a new service where you create an account and shop for all your groceries online. Then you go to the store and they’ll bring them out to your car and you don’t have to wait in line. Best. Service. EVER – I can’t wait to use it over and over. 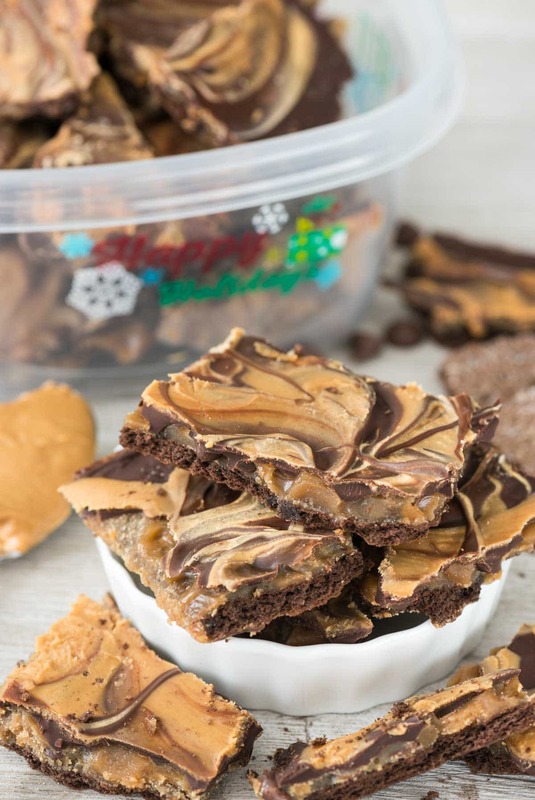 And while you’re picking up the holiday containers…grab all the ingredients to make Peanut Butter Chocolate Toffee Crack Bark. Peanut Butter Chocolate Toffee Crack Bark has a graham cracker base, an easy toffee on top, plus chocolate chips and peanut butter. Such a good recipe! Preheat oven to 350°F. Line a 10x15-inch jelly roll pan (or a cookie sheet with 1” sides) with foil and spray with nonstick cooking spray. Place graham crackers in an even layer on the prepared pan, breaking some to make them all fit. Set aside. Place butter in a medium saucepan and melt over low heat. Add brown sugar and water and stir to combine. Place a candy thermometer in the pan and then cook over medium-low heat, not stirring, until the mixture reaches 255°F. If you don’t have a candy thermometer you can also check it often with an instant read thermometer. Once it reaches 255°F, immediately remove the pan from the heat and stir in vanilla and salt. Pour and spread evenly over the graham crackers. Bake for 5 minutes. Remove the toffee from the oven and sprinkle evenly with chocolate chips. Bake an additional 2 minutes. Place peanut butter in a microwave safe bowl and heat for 15-20 seconds, or until it’s pourable. When the toffee comes out of the oven, the chocolate chips will be melted and spreadable. Spread the chocolate even with a knife and then drizzle the peanut butter over the top and swirl with the knife or the back of a wooden spoon. Chill to harden, then break into pieces. Oh man, I need these in my life RIGHT NOW (yes, it is just after breakfast, but who’s noticing?)! What a sweet treat to make for the holidays! Yum! I almost made a no bake truffle ball thing with chocolate graham crackers but I used plain. Darn, that was silly because seeing our gorgeous bark with choc crackers has me craving even more chocolate! And peanut butter! Holidays make me want to keep something sweet around to munch on AT ALL TIMES. This may have to be added to my yearly holiday snack list. I love it! Some of my favorite flavors…. I could go for some of this right now! It looks delicious!!! I wish I had some right now. It looks soooooo gooooood!!! WHY did it never occur to me to use choc graham crackers for fraham cracker toffee???? and then to put choc AND ob on top???! This is why you’re the master. I bow down. It smells amazing. And it was very easy to put together. My only suggestion is it could use more peanut butter. I used a little more than half of a cup versus the 1/3 but it could have used a little bit more because it was hard to spread it on the entire pan. I would make it again!! !